Are you looking for creative ways to make a difference? Take a look at the wish list below with items that would make a positive difference in a student’s experience at QND. If you would like to contribute to a project, please contact QND Foundation Executive Director Kurt Stuckman at 217-224-2598 or kstuckman@quincynotredame.org for more details. QND is in need of funding for continuing education opportunities for our teachers to stay up to date on the latest advancements in teaching techniques and technology. The electronic scoreboard would replace the current one on the west wall which is over 25 years old. 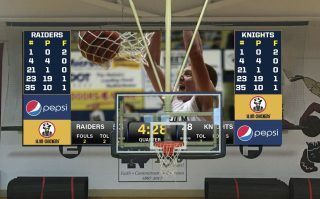 The new scoreboardwould include a digital screen for advertising and other graphics throughout games and events. The QND Choral Department is in need of a new whiteboard for learning. 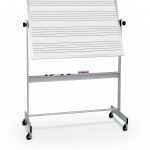 The portable dry erase music staff board is 2-sided with music staffs fused into the dry erase surface so the lines will never fade or peel off. This board would be a huge asset to the teaching and learning of of choral students. The electronic kiosk would be located in the gym and would virtually display all QND Hall of Fame inductees. With the kiosk, searches can be done for inductees by name or year inducted. This new table would replace the current one which is over 25 years old. It would be 20 feet long and be back lit for advertising. The aging wall pad along the east baseline needs to be replaced for the safety of our athletes and to reflect our school colors.